After a brief hiatus for E3 2016 madness, the latest episode of our podcast Looking Forward To It talks about the latest developments for various Square Enix titles shown at the event. Join Nova Crystallis staff editor-in-chief Erren Van Duine, senior editor Tony Garsow, Michael Damiani of Easy Allies, and returning guest Mike Dantoni. We chat about Final Fantasy XV‘s stage demo and new media — and run down the list of booth titles such as Kingdom Hearts HD 2.8 Final Chapter Prologue, Final Fantasy XII The Zodiac Age, and more! Posted in E3 2016, Podcasts. Time to talk DLC story quests that are before post game (keep post game ones a secret till after the game is out a while to prevent spoilers) or DLC gear or items. 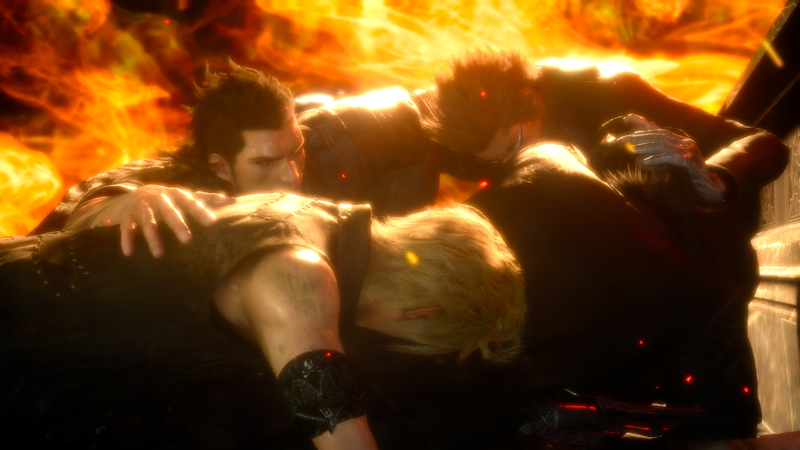 Tabata already said their focus is to finish the game, so DLC isn`t really on his mind now. Do they teach you grammar at this job? Well if that’s the case then there’s nothing new to talk about? Unless they’re telling us more character names. We literally got a news dump at E3 … how much more do you wanna know? The names of other major antagonists. There’s still two characters without names. I’m not asking for spoilers, I just want to know who that are so I can stop calling them Masked Man and Guy in Suit. The masked man has gotten a name. And guy in suit? The masked man in the robe? What’s his name? And the guy in the suit is a dude who looks like he could be Regis’ brother. Around the same age as him and dressed like an accountant. I’d rather have dlc for his original placeholder clothes from Versus 13 or clothes inspired by king Arthur since there’s lots of refs to the Knights of the Round Table. Ravus Nox Floret. If I didn’t mispell that. He is obviously from Lunas family. The man in the suit probably is no longer in the game or kept a secret for a reason. On the masked man’s wiki page last I saw it it said name unknown. But is this really offically settled? Cause it seems cliche. I’m gonna need a flat out pic with his head beside the name. The mad brother hating the guy to wants to marry his sister is so trite. This was on a official movie poster. And we don`t know if that cliche role is what he is doing, because he absolutly didn`t sound like that the last time we heard him. He or someone else is suppose to be the strongest FF villain ever. I hope he doesn’t drop the ball by being generic. I kinda doubt the hooded guy is the villian, I overall doubt they have shown him yet. Oh and supposedly Kingsglaive explains who the big 3 things behind Regis in the Dawn trailer are and some other things. And it confirms the Weapons from FF7 (or similiar entities) to exist withing XVs world. Seems like Weapons would be. There’s lots of huge boss battles it’d be a waste not to have Noctis running along a Weapons’s back or arm like Sora and chopping them up. I don’t wanna see him in a speedo. Gladio can wear that .